Like all the best poets, Matt Barnard knows how to make poems bigger than themselves; short lyrics like ‘Please Follow the Yellow Line,’ ‘The Day Twilight Went on for Days’ and ‘Border Patrol’ manage to fill the page and the time beyond their reading, treading a nice line in Larkinesque terror. Writers like Charles Boyle and Charles Simic also come to mind in the poet’s highly original metaphors, his ability to draw symbol from the everyday. There are lyrics here on everything from cows named after Jane Fonda and Bette Davis to villanelles about intellectual property and the knotty question of dying hair in middle age. This is a poet with the highest regard for the reader, who offers us poems that lay out a welcome mat, before ushering us into the conservatory to look out at that incredible, incredible view. 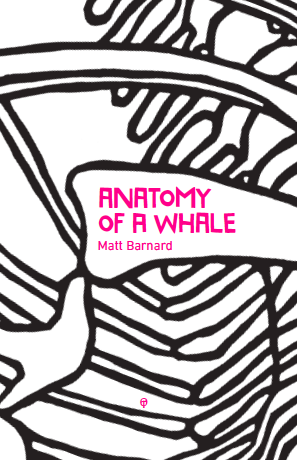 Anatomy of a Whale is Matt’s first full collection and is published by The Onslaught Press. It can be bought direct here, and is also available at www.hive.co.uk (which supports local bookshops), Amazon and Foyles. Poet and editor Janice Dempsey on WriteOutLoud.net – ‘Matt Barnard’s Anatomy of a Whale is disarmingly accessible and at times startlingly original. He explores the underside of the ordinary and aspects of the familiar that are best seen by looking sidelong…’ Read the full review here. Poet and critic Noel Williams in Orbis 184 – ‘Matt Barnard frequently and imaginatively presents different personae in largely mythic or historical contexts: Jonah; Frieda Kahlo; an anaesthetist; a baker in Pudding Lane. Sometimes, he uses a narrator, such as the brother of Midas; sometimes, first person dramatization…’ To read the full review in Orbis, subscribe here. a single unremitting story told to the end. the mysterious double e, defied us, bled sound. fields and roads to reach the sea. Could he be a god? Three days they forgot about him in the bucket. sluiced the water through his gills. before he disappeared into the blackness of himself. My grief moves like the sea, it carries me with it. the animals breathe. I feel their heat. it makes our hair brittle, our hands crack. Lions bed down with cattle, the elephant no longer moves. I still hear the screams of my neighbours, my friends. holds the sounds of their drowning children. May be salvation is in the sad eyes of the zebra. from the air. The father smiled. Very nice. then making it pour into a jug. Very impressive, the father said. and going too high. Be careful, the father said. the boy said, taking up three chainsaws. You’re frightening me, the father said. he was too busy holding his breath.